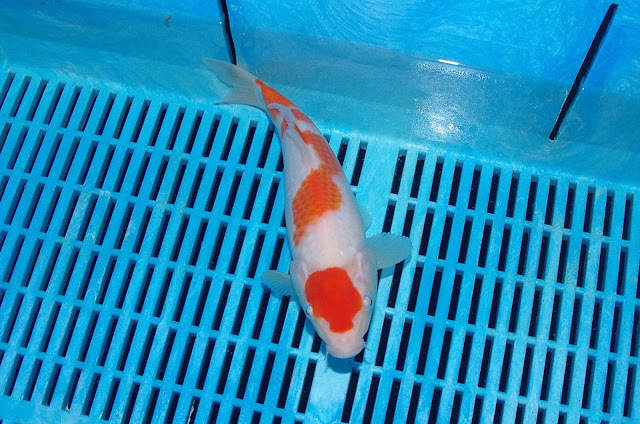 Continuing with case studies on the July 14 spawning, I found an early picture of this maruten kohaku. 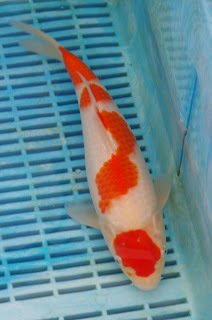 This maruten was one of two that were borderline decisions for me when choosing which to keep at nissai and grow on over the winter. The pattern drew me in, and I'm giving it one more chance. Body wise, its always been on the thin side compared to it's siblings and it's still the same way now. I guess I've kept it hoping that it will fill out as time goes by, which will help to show off it's pattern in the best way. And I see signs of that happening now, but... as I mentioned earler... this one was a borderline decision for me. So, on the positive side, an interesting case study for us to keep an eye on, and for future intel on the parent set. This is the earliest picture I can find, taken 16th January 2015. 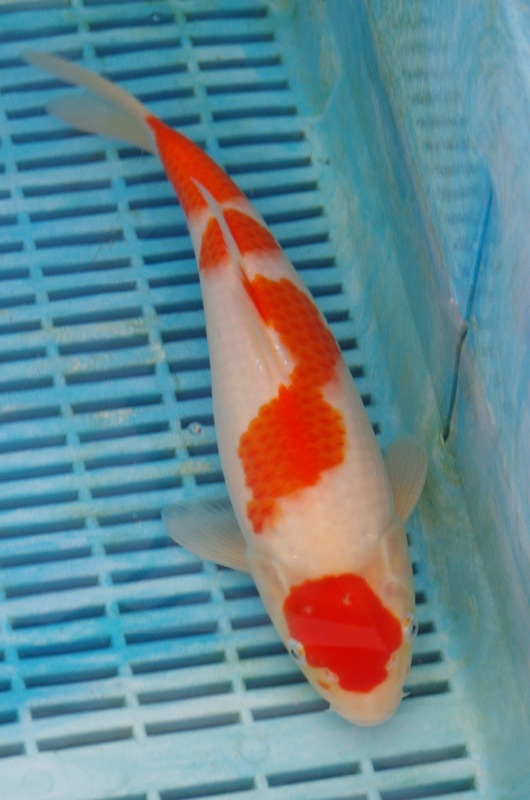 I remember at the time considering not to take the maruten through at the selection at that time because the red colour on the body appeared more washed out that most of it's peers. With a pattern like that though, I gave it the benefit of the doubt. 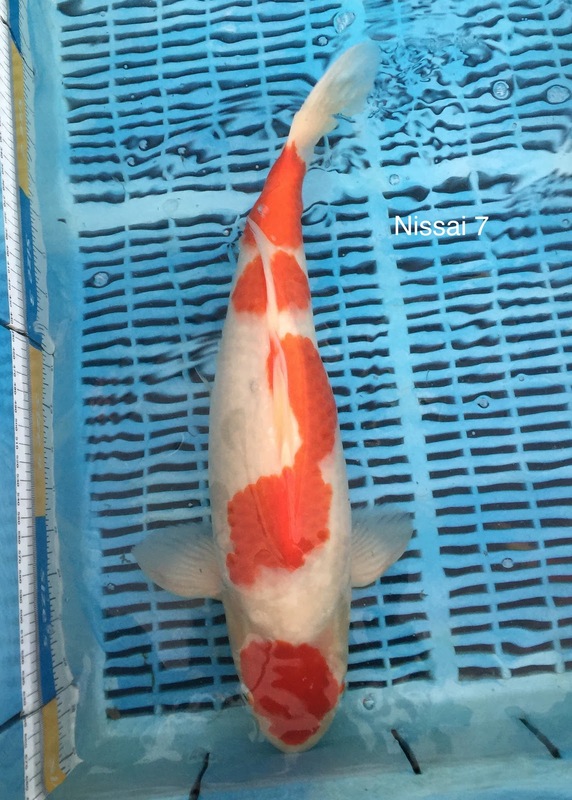 This pic was taken on 5th April 2015, and the red on the body is still a bit weaker than it's peers at the same stage. It's difficult to represent a koi as well in a picture as the detail your eye's pick up when viewing the koi 'live'; but even in these pics, you can see the difference in the colour of the red between the red colour on the head and the red colour on the body. The red on the body has thickened up a bit, and the difference in colour between the red on the head and the red on the body has narrowed compared to the earlier development pics.